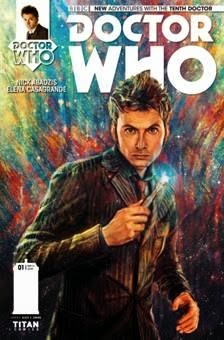 Titan Comics is releasing two all new "Doctor Who" comic series and we've got a sneak peek at the covers for both issues! First up, the Tenth Doctor will be returning in a brand new on-going series, which means a new companion and adventures throughout all of time and space. The first five issue arc will be presented by artist Elena Casagrande and written by Eisner Award winner, Nick Abadzis. The second arc will come from series architect Robbie Morrison. of the TARDIS for this new series with the Eleventh Doctor. 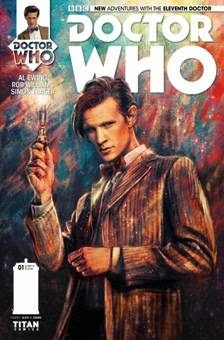 If both first issue covers look familiar, they are by Alice X. Zhang, who's Doctor Who artwork has been floating around the internet unnamed for quite awhile. Doctor Who: The Tenth Doctor and The Eleventh Doctor will hit shelves July 23, 2014. Until then, just keep Ponding and check out the gorgeous first issue covers below. Allons-y!